Webcasts of Media Squares – International Public Seminar on the New Forms of Protest and their Media (hosted by De Balie, Amsterdam, September 30, 2011). This international seminar brought together theorists, artists, designers, activists and media specialists to develop a critical analysis of the new forms of social protest and their media dimension. The program divided into two blocks. The first block focused on an in-depth analysis of the evolving WikiLeaks-saga, while the second block examined the remarkable string of protests in the Mediterranean region. These discussions were interrupted at times by startling artistic interventions in current social and political debates. Daniel van der Velden (Metahaven), Geert Lovink (Institute of Network Cultures, INC), Aalam Wassef (Ahmad Sherif), Omar Robert Hamilton (Mosireen / Tahrir Cinema, Cairo), Nat Muller (independent curator), David Garcia (Chelsea College), Jodi Dean (Hobart and William Smith Colleges / Blog Theory), X.net & Democracia Real Ya – (Barcelona), Gahlia Elsrakbi (Foundland), Nadia Plesner (Darfurnica), Florian Conradi and Michelle Christensen (stateless plug-in), Oscar Pretel (15 M .nl). 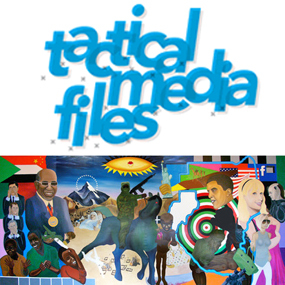 The seminar is part of an on-going research into Tactical Media, the fusion of art, media, politics and cultural activism, centred around the Tactical Media Files, an on-line documentation resource of Tactical Media practices world-wide. The webcasts of the entire seminar are now available on-line at the Tactical Media Files website, fully annotated, including background information about the speakers and links to vital resources.